(2012 Treasure Hunt) After the whirlwind experience of Recognition, some elves need a bit of alone time to think about it all. This particular spot partway up the side of Baldtop Mountain had been Hawkcall's favorite place to go off alone to think ever since he had first stumbled across it. He had found the little ledge quite by accident, while trying to get closer to the hawks and eagles that nested atop the mountain so he could learn to imitate their cries. He had never told anyone else about the place, either. He didn't exactly think of it as "his," but the place had a special, private sense about it for him regardless. Even now, in the snowy chill of winter, he found it a peaceful place to sit and think. Far below him, Hidden Lake was completely blanketed with snow, making it almost truly hidden -- only the lack of trees across its surface betrayed the shape and existence of the lake at all. Hawkcall wrapped his winter coat more tightly around himself, watching an eagle making large, lazy looking circles in the grey-blue sky in front of him. Like him, the birds he watched were predators, but unlike a wolfrider they held themselves above the rest of the world in the solitude of the air as they stalked their prey. Up here, level with their flight patterns, Hawkcall almost felt like he was one of the tribe's gliders himself, if not an actual bird. That sense of freedom applied to his mind as well, making his thoughts flow better than they did almost anywhere else. It had been four days since his Recognition with the dilligent, surly Ice. They would both be first-time parents, but Ice had made it clear in the very moments after their souls touched that she was anything but excited. Hawkcall hoped that she would change her mind by the time the cub came, but if not, he was more than happy to assume the responsibilities of raising their child if that was how she wanted it. He wondered what having those responsibilities, whether Ice chose to share in them or leave them mostly to him, would be like? Of course, he was not the youngest member of the tribe, and to some extent everyone in the tribe shared the raising of each cub. So it would not be an entirely alien experience, but there was still the thrill of actually being a father for the first time! Would his cub look up to him? Try to follow in his footsteps and fill a similar place in the tribe as a hunter, an explorer, or both? Or would the cub choose a completely different path? Would the cub have a deep friendship with him that lasted beyond childhood, or would they eventually grow distant? Hawkcall's mind had rarely ventured so far out of the Now. Many things were, and would be, uncertain with a cub on the way. But one thing Hawkcall knew for certain; he wanted to do the very best job he could as his cub's father. With that thought, he stood up to begin the long climb back down the mountain that would begin his journey back to the Holt. Riskrunner grasped another handhold on his climb up the mountain face. It had been six days since he had Recognized the tribe's gruff smith, Ice, and he needed some quiet alone time to think. A hardy climb up Baldtop Mountain's slopes seemed the best way to run off some energy and occupy his body so his mind could wander free. The climb was not quite vertical, but almost. He sweated a bit under the hot morning sun, but found he wasn't ready to return home and sleep just yet. This would be Riskrunner's very first cub, and he was naturally excited to become a father. Ice, of course, had been through pregnancy and mothering a young cub before, however. In fact, she was the eldest elf still living and had always been among the eldest elders Riskrunner could remember, while he himself was actually still fairly young. He wondered if that was part of why she seemed to lack some of the excitement he felt himself about the approaching experience of parenthood? Or had she been this pragmatic and distant the first time she became a mother? With such a private (even grouchy, Riskrunner thought) elf, it was hard to know because it was hard to ask. Hard to get an answer in any case, although some of his tribesmates might remember and be able to tell him about it should he ask. Pushing himself up further with his powerful legs to get a still higher grip on the mountain rock, Riskrunner decided it didn't matter. What was past was past, and if Ice was happy to leave their cub to him, he was happy to take it. A little further up the side of the mountain on his belly, and Riskrunner's forearm found a ledge to rest on. A final shove or two with his legs brought the rest of him up onto the ledge for a brief rest, and he looked around. A pair of eagles flew by in the sky a little ways in front of him, having and argument over territory. Riskrunner was no special expert on these about predator birds, but any wolfrider who spent as much time out and about as he did knew enough to be able to tell even at a quick glance what they were doing. He looked out and down across the slopes and cliffs of Baldtop, and even saw the sparkle of summer sun off a lake's surface far below. From where it sat, he decided that it must be Hidden Lake. As far as the eye could see, everything was green and lush and growing -- it made for a beautiful sight. As Riskrunner continued to turn recent events, and thoughts of the future with his cub, over in his mind, he finally decided that he had found the most ideal thinking spot he had yet come across. Best of all, no one else seemed to know about it, and Riskrunner decided in that moment he would keep the secret of the place to himself. 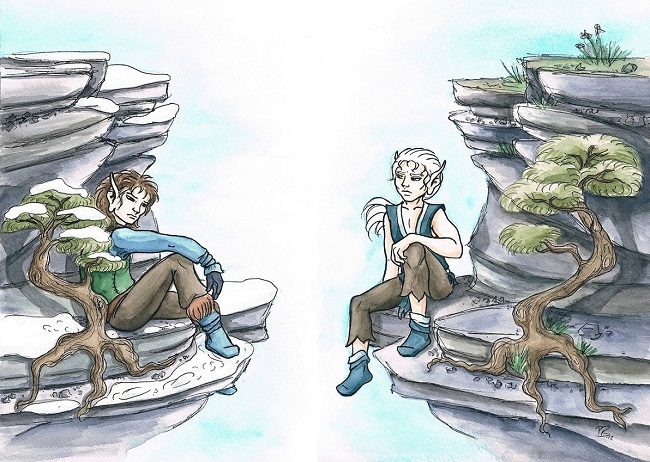 He wondered idly if any other elves had ever sat here, and if so, what their thoughts might have been? Smiling to himself, and wondering whether his cub would be a boy or a girl, he thought they could hardly have had something better than a new cub on the way to have thought about!